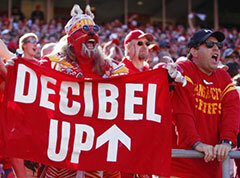 Arrowhead Stadium Louder than a Jet Plane! This past week, in an ongoing battle between loud crowds, the fans at Arrowhead Stadium in Kansas City set a new Guinness World Record for the loudest crowd roar at an outdoor sports stadium. After pushing the limits of the record for a good part of the game, and hitting about 135.4 dB during the fourth quarter, a new peak volume was set during a late-game timeout: 142.2 dB. It was measured and verified using an area sound level meter, like the 3M Quest SoundPro DL. Even the 36,000 sets of earplugs handed out by the Chiefs organization wasn't enough to help everyone. Capacity at Arrowhead is 80,000. Plus, disposable earplugs with a standard noise reduction rating of 32 only effectively reduce noise by about 13 dB, so they'd only help reduce the noise a bit, but it was still far above safe long-term exposure levels. Attendees at these arenas would be better off with the rugged full-coverage earplugs worn at Nascar events. Even though, according to a Japanese Automobile Manufacturers Association study, more than 70% of Japanese vehicles sold in the United States are built in North American assembly lines, they still contain more than 50% parts manufactured in Japan. A Chicago doctor was interested in buying a used Japanese car. But knowing the percent of import parts, and reports of radiation issues on car parts affected by the Fukushima Daiichi nuclear disaster in March 2011, he didn't want to take any chances. So, to make sure he and his children would be safe in the used car he'd found, he called us to rent the SE Inspector, a handheld digital radiation detector. Once he'd checked the car from hood to brake lights with the Geiger counter and the auto came up clean, he bought it. And he reported back to our team that he felt much safer driving the car after the test.